Your Dachshund's spinal column is made up of small bones called vertebrae that surround and protect the spinal cord (see Figure 17-1). His spinal column consists of four primary sections: the cervical spine, or neck area; the thoracic spine, or chest area; the lumbar spine, or lower-back area; and the sacral spine, or pelvic area. The spinal cord is the information highway of the body, sending messages from the body to the brain about what's going on in the environment and from the brain back to the body telling the body what to do in response to the environment. In other words, the spinal cord is the link between what you think and what you do. Without it, you can hear a car coming but you can't jump out of the way. You can burn your hand but can't remove it from the heat source. You can see something you want but can't go get it. Fortunately, spinal columns are very good protectors most of the time. In addition to the hard, bony vertebrae, fibrous, fluid-filled cushions in between each vertebra protect the spinal cord. These cushions are called disks. How do they do their job? They help the spine move more easily. They also reduce shock to the spine and spinal cord by absorbing the various jolts, jerks, twists, and turns all living beings must occasionally experience. Figure 17-1: The spinal column of a Dachshund. In some instances, however, a jolt gets through to the spinal cord and injures it or causes a vertebra or disk to break or rupture. A ruptured disk is what happens in CIDD, and as soon as it happens, every second counts. In Dachshunds, the lower spine, or lumbar region, is the most susceptible to back injury. In fact, five single disks are responsible for 99 percent of ruptures in Dachshunds. Spinal cords can't take much pressure. A ruptured disk that presses on the cord can quickly cause lasting damage. If the spinal cord can't receive blood, oxygen, and glucose, it will eventually die. And if the spinal cord dies, information can't move from the brain to the body or back again. In a Type I herniation, the disk tears and the inner matter, called the nucleus, leaks out. This type of herniation is most common in chondrodystrophy breeds such as Dachshunds, and it's a medical emergency. 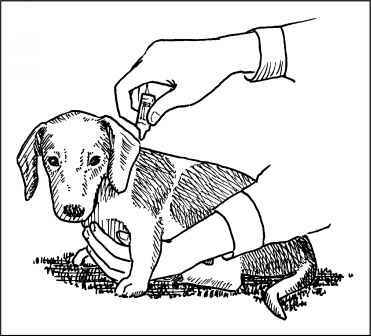 The leaking nuclear material can put damaging pressure on the spinal cord, and if the damage is too severe, your Dachshund may become permanently paralyzed. Emergency surgery — preferably within the first 12 hours after the injury (and up to 24 hours after) — often is successful in restoring function, although it doesn't come with a guarantee. ^ Type II herniation is less severe. The disk develops small tears that allow small amounts of nuclear material to escape, causing the disk to bulge and press on the spinal cord. This herniation can develop gradually and may be less obvious until it becomes severe. It's common in degenerating disks and can lead to gradual paralysis. Type II can also be treated surgically, but some people prefer to keep their pets confined so the disk can heal itself. Type II ruptures typically manifest as back pain and respond well to medical therapy and cage rest, but they eventually recur. Type II herniations can be dangerous for several reasons, however. Too much bulging can cut off nutrients to the spinal column, causing it to die a slow but permanent death. Also, the Dachshund's body could interpret leaking nuclear material as a foreign invader. In some dogs, the immune system will attack, causing further damage to the spinal cord. Where do dachshunds spine start and end? 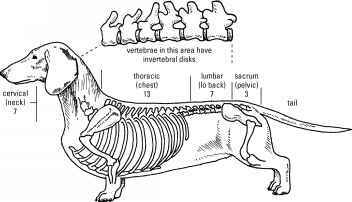 How many vertebrae do dachshunds have? Where does your spinal start and end in a dog? 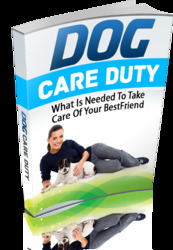 Can spinal jolt cause a dog to die? Why daschund is a chondrodystrophic dog breed?